Kalamaki has exploded in the last few years – from a tiny hamlet, it’s now gradually transforming into a full-blown tourist resort. This change is happening because there are now two roads to Kalamaki, and the village itself has a nice beach. The atmosphere here is pleasant, and prices are still rather low. 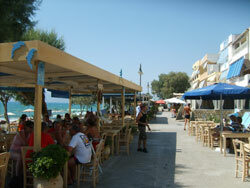 There’s a promenade along the beach with some good restaurants. On the street behind this, you’ll find the hostels and shops. 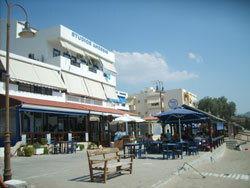 The famous village of the hippies Matala is less than 10 kilometers away. Also the quiet village Pitsidia is close. Kalamaki is a wonderful retreat for families and those who are seeking a quiet holiday. Most tourists here are German, but increasing numbers of British tourists are coming. 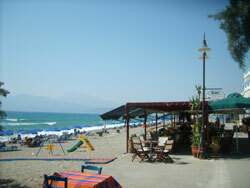 Many come for Komos beach (nudist), and Kalamaki is gaining more and more regular visitors. As a bonus, there’s also a fantastic new public open-air swimming pool (€3.50 in 2008). If you don’t have a car, getting to Kalamaki can be something of an adventuce – there’s no direct bus connection, and Kalamaki doesn’t have taxis! The bus to Matala stops 2 or 3 km away on the main road. From Pitsidia you can walk to Kalamaki in around one hour. There are no direct buses to Kalamaki (information from early 2019). Just south of Kalamaki the long beach of Komos starts. 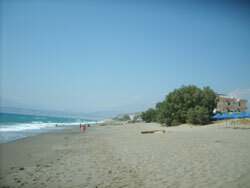 In my opinion, it’s the best beach on Crete. Komos beach is more than 2 km long, with the first 1500 meters dominated by nudists. At the end you can rent deckchairs and umbrellas. There is a simple beach bar where you can buy sandwiches and chilled soft drinks. Just behind the beach there’s a fenced-off archaeological site, containing the remains of the Minoan port of Festos. Even in the high season the beach is not crowded; 200 people spread out over 2km is about the norm. This may not be so in a few years, however: the area is very much a rising star. 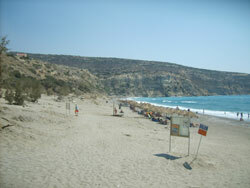 Komos is also a beach where big turtles (Caretta Caretta) lay their eggs during summer. The hatching baby turtles look for the moonlight in order to find the sea, and every other light must be off. For this reason, camping, night parties and so on are strictly prohibited at Komos beach, which high fines. 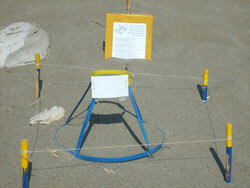 The nests are marked with information signs about the turtles. Unfortunately the nests decrease in number yearly. There were just a few left. There is a small street leaving Pitsidia going to Komos, and tourists mostly walk (30 mins), whilst the Greeks prefer to drive.